A recent blog post from the Center for the American Experiment (CAE)—Minnesota’s right wing think tank—features an overjoyed Homer Simpson. Homer apparently celebrates the “bonuses and pay hikes” that Minnesota workers are supposedly receiving through recent federal tax cuts. 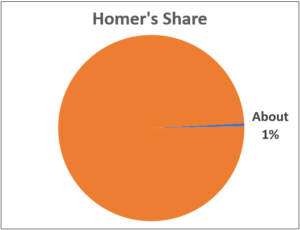 Only Homer—a slow-witted sap that can be duped into any harebrained scheme by a bag of donuts—could think he wins through this most recent foray into trickle-down economics. It is also very much in the political interest of companies to attribute to the new tax law the changes they make to salaries or investment plans. That’s a surefire way to win favor with Mr. Trump, a notorious sucker for flattery. And it is a way to deflect attention from the insidious aspects of the tax law: It will add about $1.5 trillion to the federal deficit over 10 years, and many poor and middle-class families will pay more taxes over time. The corporate pay hikes listed by Americans for Tax Reform don’t include layoffs and business closures that have occurred since passage of the federal tax act. On the same day Walmart announced its pay hikes, it closed 63 Sam’s Club stores nationwide, affecting 9,400 workers. A fair reckoning would offset the pay hikes occurring since passage of the federal tax act with the wage losses due to layoffs and business closures. A precise sum of all the pay hikes attributed to the federal tax act by Americans for Tax Reform cannot be determined; many businesses give only a range of bonuses and pay hikes given, while others do not identify the number of employees affected. All pay hikes and bonuses attributed to the federal tax act that can be quantified from this list total about $1 billion. If we assume that all of the other pay hikes that can’t be quantified add another $0.5 billion plus, then the grand total of pay hikes and bonuses attributed to the federal tax act would come to approximately $1.5 billion. We have to suppose, of course, that all these pay hikes listed would not have occurred in the absence of the tax act—an extremely generous and unlikely supposition. This estimate also ignores all post-tax act layoffs and resulting wage losses. According to the Institute on Taxation and Economic Policy, next year U.S. businesses will receive $157 billion in tax breaks due the 2017 tax act. Based on our rough back of the envelope calculations, the pay hikes resulting from the federal tax act will come to about a penny on the dollar of the total tax relief bestowed on businesses. A large portion of this penny consists of one-time bonuses; while the business tax breaks resulting from the federal tax act will continue into future years, the bonuses for workers might not. Over time, the workers’ share of each dollar of business tax breaks could shrink to less than a penny. American corporations already have more money than they know what to do with. Their profits are at record levels. They’re using them to buy back their shares of stock, and raise executive pay. That’s what they’ll do with the additional $1 trillion they’ll receive in this tax cut. Spending cuts will probably not offset the estimated $1.5 trillion increase in the federal deficit inflicted by the tax cuts. In turn, the federal government will need to issue more debt, which could potentially crowd out private debt issuance that funds economic expansion. The end product is a less vibrant economy with less job growth, which in turn means less upward pressure on wages. In the long run, lackluster economic performance, fewer jobs, lower wages, and reduced federal benefits will almost certainly overwhelm trifling and possibly temporary pay increases from the federal business tax cuts. So enjoy your penny while you can, Homer. In the end, you and other working people will be left holding the bag for the 2017 federal business tax breaks.